German report claims that Bashar al-Assad may not have known about the use of chemical weapons against Syrians. 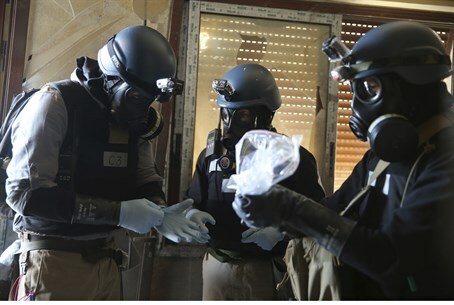 A report Sunday said that German intelligence had determined that Syrian troops may have used chemical weapons in a deadly attack last month without the permission or knowledge of President Bashar al-Assad. The report in Germany's Bild am Sonntag newspaper quoted German intelligence as saying that it had evidence that Assad may not have ordered the chemical attack on a Damascus suburb last month. According to the report, German intelligence had intercepted numerous messages from Syrian field commanders to the Presidential Palace, asking for permission to deploy chemical weapons against rebels. Each time, permission was denied – leading intelligence officials to conclude that the weapons may have been used by “rogue” units who did not receive permission from Assad. That report contradicts one that appeared in the German media several days ago, in which the chief of staff of Germany's armed forces, General Volker Wieker, is said to have told German legislators that it had “much evidence” that Assad ordered the August 21 attack, in which some 1,400 people died. During that meeting, attendees told reporters, German intelligence chief Gerhard Schindler said that Syria's civil wars could go on for years. Schindler also said that contrary to Assad's claims, only his forces, and not the rebels, have such weapons, and that the Syrian president kept close control of them. Schindler said that it was very likely that the weapons were used prior to August 21, but that the poison was diluted, resulting in fewer deaths. German leaders have stated that the country does not plan to participate in any Western or American-led attack to remove Assad from office, at least until it sees a report from UN weapons inspectors due out this weekend.